Fast Lane RC's Lamborghini Gallardo looks fast just sitting on the shelf, just like the Dodge Viper they make in this same series. Built to 1/10th scale, it's about 18 inches long. All batteries are included, with a rechargable 9.6V pack used in the car. The controller is of the professional "pistol grip" style with a steering wheel, and it features two forward speeds. if you squeeze the trigger half way, you get normal speed. Squeeze it all the way in, and the car goes into "turbo power boost." I was really anxious to take my first drive with this car. Unfortunately when I first squeezed the throttle trigger on the Fast Lane RC Lamborghini Gallardo, it was so slow, it was depressing. A real let-down. I went ahead and went into "turbo power boost" mode and never used normal speed again. The "turbo" speed is decent -- it's more than enough to give plenty of excitement to kids at the younger end of the recommended age range, but probably a little slow for older users. Steering is just a little lazy, lagging behind your controller commands. If you want to take a tight, hairpin turn, start your turn normally at full speed, then for just an instant put it into reverse to lock up the rear wheels and cause it to fishtail around. That's actually pretty fun. 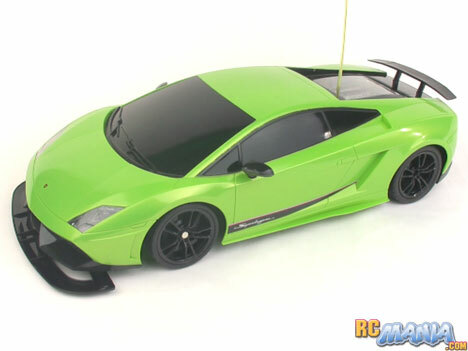 While the Fast Lane RC Lamborghini Gallardo in 1/10th scale and its Dodge Viper cousin are not very fast by an adult's standard, these cars do have a "6+ years" rating, and for kids of that age, I think these cars will seem fast and cool. The great detailed appearance and high-quality paint job will definitely bring a lot of pride to young owners. On top of that, the price is very respectable for a set that includes a rechargable battery, charger, and even the battery the controller needs. In all, this Fast Lane RC car isn't a star performer, but I think it's a decent deal, so if you like what you see in the video, go for it! Given its price and size, though I would recommend that you pay the small extra fee for the Toys R Us product protection plan, so if you get unlucky and something goes wrong due to a defect awhile after the purchase, you can still get a replacement vehicle with no hassle.